Just About Anything: Don't Be Alarmed! ou may have noticed that something's amiss on my right sidebar. Can you guess what it is? Yup, you got it right. My blogroll is no longer there. But don't fret. Your links are still all here and intact. I just moved them to new page that I now call My Bloglist. Can you see it up there on my Navigation bar? I had a hard time figuring out how to do that first but realized that I can also manipulate the way I published the page. I will be categorizing it further to make it more organized. Once my OCD starts kicking in, you'll know! 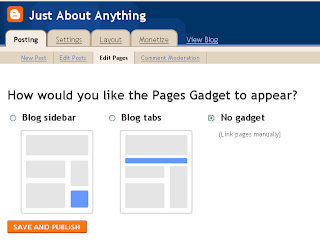 Choose No gadget and then hit Publish. View the page and copy the link URL of your page. Be sure to click on SAVE TEMPLATE for your changes to take effect. And that's it! P.S. 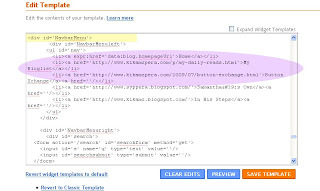 This short how-to is for blog templates having their own Navigation Bars or Menus. Well, I hope you liked the new changes I made around this blog! Thank you for the visit! I'm following sis, thanks, I will try to check and make some changes on my blog too. Hope I can do it, can I ask your help if I can't do it? Hehe, just want to ask. Thanks for this info. Thanks for this, you're a marvel!!! I could never wrap my mind around these stuff, lol. I have yet to try this one Marce soon when i get ample time for it.Good thing meron na ganito on blogger like what i saw with other bloggers using wordpress. :D Nice little tutorial.God Bless! ang galing naman, I am not good in tweaking and adding codes wahhhhhh kaya boring ang pages ng blogs ko... good job sis.